Everyone knows about the London to Brighton charity ride. It’s in the summer, it’s hot, and it packs the roads with around 30,000 people each year. Not this time. 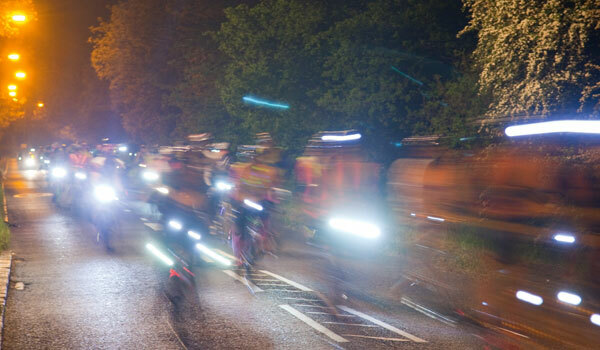 The British Heart Foundation (BHF) London to Brighton Night Ride was a different experience entirely. Beginning on Clapham Common at Midnight, nearly 5,000 excited riders buzzed around eager to get going. The route cruised past frustrated traffic and drunk well wishers to the outskirts of London – then onwards along a mostly similar route to the famous charity event. Through Coulsdon and on to the Surrey countryside of Merstham, Nutfield, Cuckfield and Burgess Hill. Along the course bustling food stops were well managed by the staff, and despite many a tired eyed rider, everyone was in good spirits. Thanks, in part, to the Haribo. Equally good were the marshals, staying alert and smiling through the early hours to see that riders made each junction facing in the right direction. The atmosphere was so fun it seemed, that some unregistered riders were caught up in the excitement around the start in London and managed to make it half way to Brighton before realising what had happened. To continue in darkness or to return to London against the constant flow of riders was a decision I wouldn’t have liked to make. Along the route a few testing hills split the serious riders from untrained adventure seekers. But with everyone enjoying the ride it was more smiles than frowns from the majority of entrants. Taking place during a mini heat wave, we were spared a freezing cold night and only had to endure some cold blasts as we descended the various valleys on route. With it getting light in the very early hours a real sense of fun and adventure hit home. Riding through the night is something everyone should experience and, as well organized as this, is actually a very easy thing to achieve. The one big change of note was the removal of the last killer bite, Ditching Beacon. For this event, Devil’s Dyke – a smaller sibling of the South Downs’ many hills, replaced it. The double hilled climb was a last hoorah for many people who knew they were close to the finish. An exhausted crowd gathered at the top to admire the beautiful views before the final descent. From there, a nice easy ride to the Brighton sea front saw most riders recovered enough for big smiles as they received their medals at the finish. This article was first published in the September 27 issue of Cycling Weekly. You can also read our magazines on Zinio and download from the Apple store.